Please find attached entry details for the WM Schools event for 2019, due to take place on 11/05/19 at Shoal Hill. I would ask you to please send this around your clubs to be passed onto parents and teachers for entries. Please share this widely to allow everyone who wants to enter to do so. Details will be added to the WCH website shortly. Entries close on the 3rd of May. For any queries, please contact the event organiser Vicky McCreadie (copied). ​Please contact our Schools rep Tony Callow for more information.. Provisional results from todays Boreatton Park YBT/WML event here..
Saturday 2nd February. Sitting down at 7pm. Apple pie with custard, Lemon meringue, Toffee cheesecake, Chocolate fudge cake or ice-cream. £15 - Adults / £10 - Children. Coffee £1 extra. Mail me at cliveandsharron@gmail.com with numbers and pudding choice. 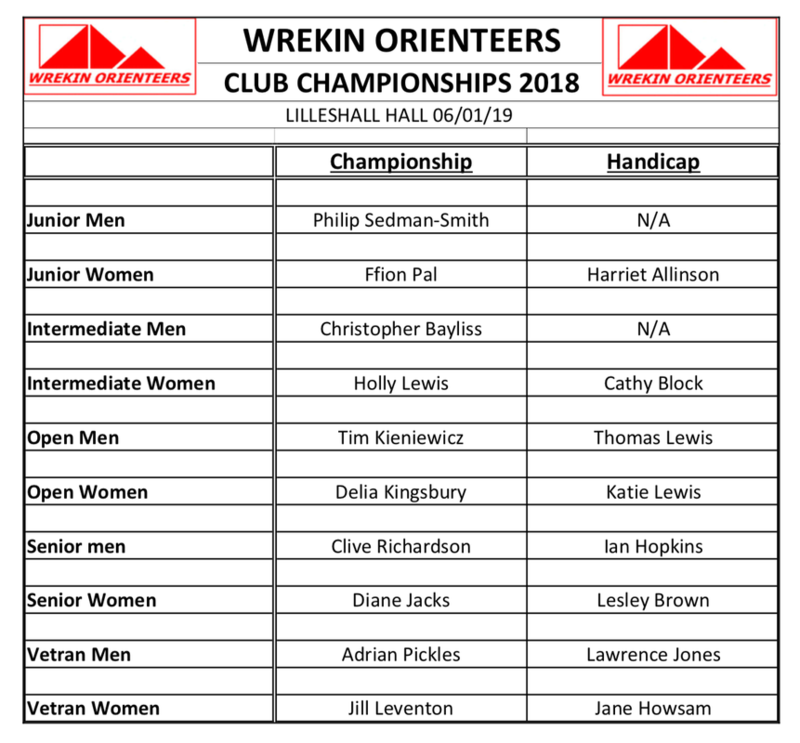 The Wrekin Computer has been whirring away and finally come up with this years (sorry last years) Club Champions...Congratulations...trophies will be presented at the Club Dinner. Score event with 45 minutes to visit as many controls as possible. Finding controls means gaining points, being late back loses points. The controls will be numbers or colours of street objects like lampposts, hydrants and front doors. You will need a torch, a pencil, a timing device, a map case, some Hi-Viz clothing and road shoes. You could take a compass and whistle. Mass Start at 7.00 p.m. Cost: £1.00. There will be a designated social venue to visit after the event. Indian or Fish and Chips. Details on the night. Course Results are available for todays Club Champs, Steves working on the handicaps etc..so check back later. Back by popular demand...probably the toughest way to earn a chocolate bar.....but definitely the most satisfying.....its CHOC-O 2018.